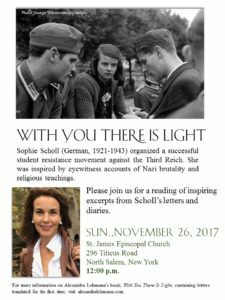 The first excerpt I read last Sunday came from Chapter Three of “With You There Is Light.” Sophie Scholl attended St. Georges, the Protestant Church in Ulm, with her mother. Sophie noted reading Exodus 17:11 in her journal so I imagined and wrote about a sermon where the Pastor may have preached from it. The second excerpt that I read is quoted below. These two excerpts led to an interesting dialogue about the difference between religion and spirituality. Sophie Scholl was motivated by both. Excerpt from Chapter Four. It is the winter of 1941. The German Army and Fritz Hartnagel are pushing into the endless freezing Russian steppe. The quotes inside this passage (part of conversation) are from Sophie Scholl’s journal and are reproduced with the permission of S. Fischer Verlag, Frankfurt. “Even though Hans’ new girlfriend wasn’t from Schwabia, Sophie was pleased that Traute Lafrenz could keep up. Hans led them down the snowy slopes most of the day, and they bellowed and laughed from the fresh air and friendship. At nightfall, when they reached the cabin, they gathered around the fire and read passages out loud from a Dostoevsky novel. Their protest against the war, Hitler, and his insanity, consisted of reading the enemy’s finest writer. Before the clock struck twelve on New Year’s Eve, they ran outside and observed the full moon illuminating the stone-blue mountain. The pine trees cast long shadows. Sophie shivered, trying to name the constellations. She was the first to hurry back inside the warm cabin. The light from the fireplace illuminated the sharp lines on Traute’s aristocratic face. 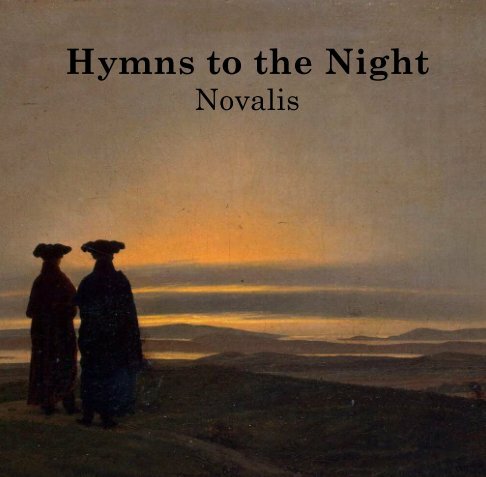 “Novalis has cured my hunger,” she added, trying to break the spell cast by her beauty. “What hunger?” Hans asked, wrinkling his forehead, and sat down on the ledge of the fireplace beside her, throwing his finished cigarette into the fire. Hans shook his head in disagreement. Traute said nothing in her defense. Sophie picked up the thread of her idea. He had spent enough hours discussing this with the renowned religious Professors Carl Muth and Theodor Haecker in Munich. 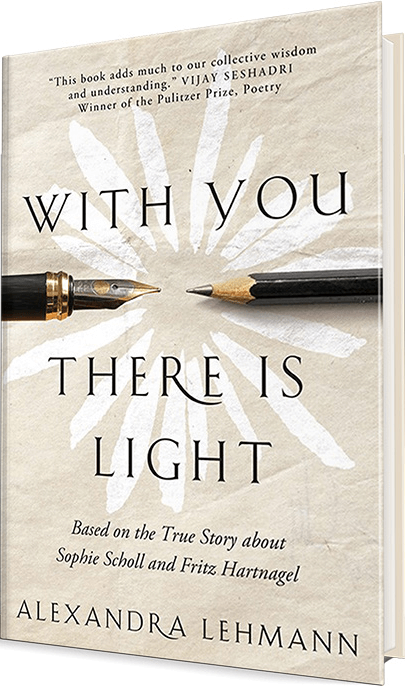 Both had been banned from publishing and teaching, but they still held secret student talks. That’s all Hans said about them. He continued in an authoritative tone. Sophie was unprepared to accept his strict religious opinion. She straightened her back and choosing her words with care, she spoke in a strong and clear voice. Sophie strung the words together like pearls. She continued. 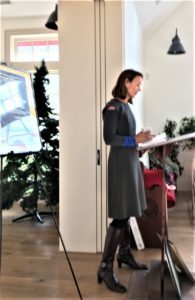 When she finished speaking, she looked up at the cabin’s wooden ceiling and put her fingers to her mouth as if she might have forgotten something. Satisfied that she had completed her thoughts, she smiled back at the silent group. The months that Sophie had spent isolated at the women’s camp and alone in the village strengthened her. The lonely hours had exposed her deepest fears and darkest thoughts. There was an answer to all of this fear. This newfound strength would be what defined her.